You don’t start your volleyball career at the Olympics. To get there requires a long, time-consuming and disciplined approach to the sports, which generally begins at a young age. In most leading volleyball nations youth training begins as soon as the child begins to acquire a level of eye-hand and eye-foot coordination that enables them to play the ball, and importantly, the mental focus necessary to acquire an those basic skills through repetition. The big question is for athletes at that age, no one really knows whether volleyball is going to be their main sporting interest. The solution is the new First Stepz, a once-per-month outreach project to encourage more youngsters to have a go at volleyball without putting the demands of expense, travel and time on parents before they know whether their child’s interest in the sport is a passing phase, or something more permanent. And it can also act as a fund-raising activity for the host organization. 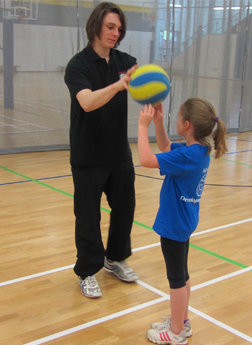 Starting in late 2018 VbDC will work with schools, leisure centres, churches, social groups and established clubs wanting to start a juniors section, to offer half-day introductory courses to volleyball. VbDC will provide the necessary specialized equipment such as low nets and lightweight balls, and the course will be led by coaches who have experience in introducing volleyball to 8 to 14-year-olds who have never previously played the sport. Organizations that have a minimum of 30 youngsters who would like to try their hand at volleyball can contact VbDC to schedule a First Stepz Camp to come to their area.